Nature of Mercury: Mercury is adored for bestowment of blessings of good education, business, sharp intellect, and pleasing appearance and also to keep off from heat-induced ailments, general debility and depressions. The planet also monitors the family affairs in life. It is related to peace of mind, earnings, intellect, education and business, if it is favorable. Mercury in Vedic astrology is known as BUDHA, the awakened discriminating intellect and the part of us that knows. Mercury is benefice if associated with benefice grahas, and malefic is associated with malefic grahas. He is known as grahapati, or lord of the planets. Mercury rules over two signs of the sidereal zodiac, Gemini(Mithun) and Virgo(Kanya). He is exalted in Virgo at 15 degrees, and in his fall in the opposite sign of Pisces(Meen). Where the Moon is the innocent mind, Mercury is the intellect that discriminates between benefic and malefic ideas, or good and evil. The intellect is neutral and becomes whatever it is associated with. Mercury is learned in behavior. Mercury is a karaka or indicator of intelligence, commerce, education, communication writing, books, humor, scholars, thieves and astrologers. Vedic sage Parasara describes him; "Mercury is endowed with an attractive physique and the capacity to use words with many meanings. He is fond of jokes..."
There is a relationship of enmity between the Moon and Mercury that belies a deep truth. The Moon is innocent in its observation, while Mercury is evaluative and discriminating in its observation. BUDHA or MERCURY is considered as the greatest among the wise. This Devata bestows wisdom and wealth etc. on his devotees. He removes evil thoughts from their minds. He is the chief among GNANIS (realized souls). He is considered Vishnu Rupi, because of his beauty and resemblance. A prayer to Him, especially on Wednesdays brings in manifold benefits like removal of all obstacles, helps one to get a progeny, possession of fertile lands etc. 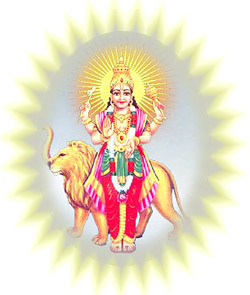 In the Zodiac this Devata is the Lord of Mithuna and Kanya. He stays like the Sun, one month in each Rasi completes the cycle in 12 months, more or less closely in the footsteps of the Sun. Mercury's favorite placement is rising in the 1st House. His nature is VATA, or Airy. His gem is Emerald and his metal is all form of alloys. His direction is north and his ruling day is Wednesday. Mercury rules the zodiacal signs Virgo and Gemini. Friends of Mercury are the Sun, Venus, Rahu, and Ketu, Mars, Jupiter, and Saturn are neutral to Mercury, and Mercury maintains enmity with the Moon. Mercury Nakshatras relations: It works well with Ashlekha, Jyeshtha, Revati, Rohini, Hast, and Shravan nakshatras and gives auspicious results. It gives inauspicious results in Adra, Svati, Pushya, Anuradha, Chitra, and Magha nakshatras. Mercury Period: It gives its best results when its native is between thirty-two and thirty-five years of age. Mercury Diseases: When ill-aspected, Mercury gives chronic dysentery, constipation, lack of digestive fire, lung diseases, asthma, restlessness, kidney problems, fear, neurosis, and madness. Mercury's benevolent influence will keep a person in god stead in relation to family, society and occupation linked with accounting and education. It also makes you lovable and favourite among your relatives. May Mercury help and bestow you with all the good ways, we wish.